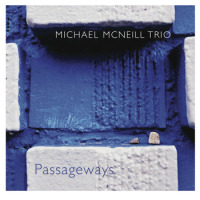 Michael McNeill and his trio (bassist Ken Filiano and drummer Phil Haynes) return after Passageways with the marvelous Flight. The first notes of "Placid Ruffled" indicate McNeill's classical background and compositional intent. The album is extremely well recorded, allowing, at least with headphones, for every overtone and their interactions to be heard clearly (especially in "Land"). This sound world envelopes the ear and prepares the way for music that lies between the purely abstract, tunes and sound paintings. 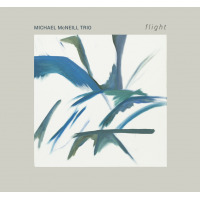 Brimming with intelligence and passion, McNeill's compositions, even those that are "tunes" ("Za" and "In That Number") twist and turn in unexpected directions that nevertheless feel logical and purposeful. McNeill has an extremely solid rhythmic sense and hence can play behind, on, and ahead of the beat with no sense of confusion, but rather one that always provides a feel of knowing direction. The support given by Filiano and Haynes is magnificent; they play an equal part in the music, creating music that can be from this trio and no other. Both are extremely strong and are quite at home when playing in a more standard harmonic/rhythmic role as well when called to become abstract sound painters. All of these features come together in "Wild Geese Suite," arguably the core of the album, and one very intense twenty-three minutes of music. Made up of three parts, "Cloudburst," "Placid Ruffled" (this time filled out) and "Follow Our Sun," the suite paints an extremely large sound stage that seems to be suspended in mid-air. The sound of the opening of "Follow Our Sun" is extremely reminiscent of the Bobo Stenson trio with Anders Jormin and Jon Christensen, which gives some idea of how this music sounds at once very precise, but also intensely compressed. Engaging from start to finish, Flight is one of those special albums can be enjoyed on many levels. Welding complexity and abstraction with rhythmic drive, and encompassing a very wide range of emotion, McNeill, Filiano and Haynes have created music which is timeless, with more of its secrets revealed with each listen. Track Listing: Placid Ruffled; Za; Skies; No Dice; Picture Window; Land; Wild Geese Suite: Cloudburst, Placid Ruffled, Follow Our Sun; In That Number.